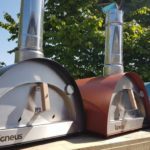 The Igneus Bambino – another state of the art pizza oven brought to us by this popular company to meet demands from the increasing numbers of pizza chefs out there. The Bambino caters for those who want all the benefits offered by an Igneus oven, but in a slightly smaller package than the original ‘Classico’. Available in three unique colours Matt Black, Antique Copper and Verdigris Blue the Bambino pizza oven produces high-quality pizzas and is great for those who love to host a good garden party. Its compact size makes it the perfect addition to even the smallest of gardens, without compromising on pizza size too much vs it’s bigger brother. The Bambino works on a standalone basis so isn’t reliant on a gas connection or a BBQ. It doesn’t have a base or leg assembly however, so you’ll need a suitable surface on which to rest the oven itself. The Bambino is entirely insulated inside and out, making it safe for everybody to use. Wooden logs fuel the Igneus and a built-in thermometer monitors the temperature. The pizza oven can reach 400-500 degrees Celsius in only 10 minutes. Impressive right? We recommend using silver birch wooden logs as these will provide a greater burn time. At these temperatures your pizza can be perfectly cooked in as little as 60 seconds. The oven is very well made and has a robust feel – constructed of stainless steel, with a powder coated aluminium roof in your colour of choice. The standard warranty is for 1 year, however we’re sure you’ll get many more years of use out of it. The Igneus Bambino comes with a fire brick base and a detachable chimney, making it a truly portable unit with dimensions of 59 x 57 x 87 cm and a total weight of 35kg. Removing the bricks for easy transportation reduces the weight of the unit itself to 17kg so it’s easy to load and unload from your vehicle. The Bambino is therefore a great option if you’re considering cooking pizzas at festivals or outdoor events – making this one of the most versatile outdoor wood fired pizza ovens we’ve seen! With the large cooking area of 50cm x 50cm, this opens up the possibility of putting a large baking tray inside meaning you aren’t limited to cooking just pizzas – why not roast meat, make a lasagne or bake bread? It doesn’t come complete with accessories unless you purchase them as part of a bundle. As a minimum you will need to purchase a Pizza peel and an ember rake. Although a little pricier than some of the other similarly sized pizza ovens, we love the Igneus Bambino and think it’s a great addition to any family home. We feel the price tag is justified in it’s construction as you can truly feel this is a quality item which will last for years to come. With it’s unique and contemporary design, this model puts a modern twist on a typically rustic appliance which will look just right in any setting.